Well Aria’s transition to home continues to go well. Yesterday we plucked up the courage to take her on her first outing. Predictably it was to Target (our favourite store) and Aria had a great time. She picked out the things that she wanted; shoes, a drink bottle, sun glasses, a towel, pillow cases… She really enjoyed the new sights. She also spent the whole day from when she got up till bedtime with her speaking valve on. She was very excited to put it on in the morning so she could talk to us and tell us what she wanted. It also seems to be helping with her breathing too as the different air flow it creates to allow her to speak also increases the strength of her cough. Adding to this great day for Aria was that she spent about 6 hours breathing regular room air (she has been on oxygen support most of the time since she got off the ventilator). So all in all Aria is going really well. The next big challenge is getting her moving under her own power again. We gave her some time in her walker today but she was pretty reluctant to give it a go although we did walk around the lounge a wee bit. Slowly but surely we’ll get there I’m sure. Lastly there was a comment on the last post regarding why God made Aria unwell in the first place and why he doesnt’ get called out for that and just gets praise for making her better. Aria’s unwellness is a sad thing. In a perfect world everyone would not have to suffer sickness and death. However the reality of life is that there is sin and evil in the world and all of us are cursed by it. 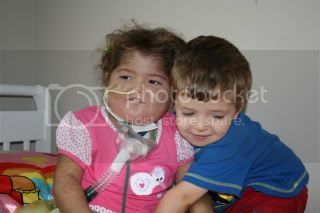 Aria was born subject to this curse and in her life it meant she was born with this terrible genetic condition. While God could have prevented this, his plans are far superior to ours and he sees the outcome from the beginning and only intends good for his people even though sometimes its hard in the interim. Aria’s illness has been a great blessing to us as parents and to many around us. Not only has Aria’s character been inspirational, but the way the various challenges we have faced has shaped us has made us much ‘better’ and different people than a life with a ‘normal’ child would have. We have come to know and trust God in a way a regular life would of failed to inspire and we praise God that he has chosen us to care for this special child and entrust us with such a special journey that has touched many lives. We do praise God for his answering prayers for her restoration to us, but we praise him more for the comfort that even if Aria was not to recover and would pass, that God has guaranteed that she would have healing and life eternal with Him, in heaven, through the death of His own Son, Jesus. I’ll leave this verse with you all as well as the one you can read at the top of the page…. Genesis 50:20 You intended to harm me, but God intended it for good to accomplish what is now being done, the saving of many lives. Aria’s 2nd night at home was much improved. Hamish managed to tape her o2 probe to her foot AND tape her sock to her foot so from 2am to 6am there were no alarms. And he only had to suction her once. The speaking valve helps expand her lungs more and we are getting out some lovely junk that has been sitting there for awhile. So so pleased Aria has embraced it. This morning she was really excited to put it back on. She has been saying lots of things. We were watching the Little Mermaid on TV and she said ‘dolphins’ when they came on. And she is back to saying No Way! Aria is having a nap now and then we are hoping to take her to Target for some bits and pieces. Yesterday we put them both in the stroller and went for a walk around our apartment complex, it was so stinkin hot though we had to come back inside. 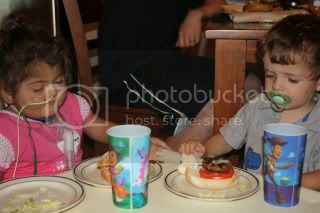 This is Aria and Asher having dinner at their little table. We had hamburgers and chips last night and Aria enjoyed constructing her burger. Urine output continues to be really good. Next big hurdle is to get her in the walker and work more on the PT side of things. Just being home her range of movement is much better. Yesterday she sat on the floor and reach right over to get a toy and used her other arm to rest on, great stuff. 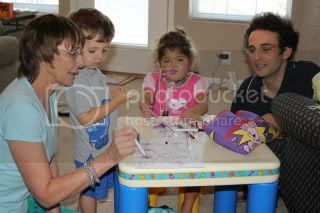 And she loves to sit at her table and she sits well independently using her trunk and arms to support herself. 24 hours at home and…. Aria has been home 24 hours and things are going pretty good. Last night was pretty tough, I think Asher as a newborn was less work. Not much sleeping happening for either of us. Aria found it hard to settle and kept pulling off her toe prob off to get our attention thus making the machine alarm. We have rearranged the kids bedroom today and made some other changes so fingers crossed that helps. Asher is very pleased to have Aria home but I think a bit confused and therefore uncharacteristically whingey. It is a touch trying on our patience because we aren’t used to him being like this. The two biggest wins for the day would be firstly getting her to wear her speaking valve. We have only managed to keep it on her for 2 mins at a time but we managed to convince her of the need to have her voice (after she pulled off her tummy dressings to get our attention). So she has been wearing the valve for a good couple of hours now and seems to be used to it. We have been able to hear her voice and she is using more of her words. Secondly her urine output seems to of increased heaps. I had to change her nappy/diaper in the middle of the night and this morning there was another very full one. Her ankles and legs seem lots less puffy and softer to the touch. Of course we aren’t weighing her nappies like in hospital but we ‘know’ her output pretty well from feel and can tell it has improved. Hamish and I have found the whole thing rather stressful to be honest. The house was a complete tip with all the consumables and equipment needed. SO thankful for God’s timing in having Christine here. She has tidied and organised all the stuff we brought home from hospital (a lot) and helped with the kids room. Very grateful for her servant heart. Not sure how we would of managed to be honest without them being here. Thanks for all the lovely comments, we really appreciate the support. There is lots of work being done and none of it is being done by me. Operation Home is being managed by a team of people and they assure me they are all sorted. In fact I don’t even have to tell them what time we will be home with Aria, they are ready and waiting for our call that we are home bound and will meet us there. AND tomorrow we clean out the room of everything- EVERYTHING. Anything that isn’t nailed down we are taking. Ok not quite that- but if it has been billed to Aria’s account and we can use it at home it is coming. We did a car seat test on Aria today. Normally this is done on little premmie babies to check they can manage carseats rides without comprising their breathing. Baby capsules bend babies in the middle (rather then laying them flat) which is why carseats should stay in the car! Even though Aria can sit upright we want to get her belted in and make sure she wouldn’t get uncomfortable and slump down- she did great! Hamish is rooming in with her tonight and doing all her cares- just like at home. Hopefully they will both get some sleep. Hopefully the next post will be to announce Aria’s home coming! Sorry Aria fans for the lack of updates! Hamish and I ended up heading away for TWO nights to Nebraska City. Or Nebraska ‘City’ as we have been joking- kinda like a small version of Cambridge, beautiful. We stayed in a beautiful lodge funnily enough called The Lied ha ha. We had a GREAT time, it was hard to come back which it hard to say because we missed the kids. But it was hard to come back and back into the reality of hospital life. Aria’s time was uneventful and boring so the surgeon on told us. Some fine tuning of her labs and general condition. She is having an allergic reaction to something, lasix was the theory. Not to be confused with Latex although that is also off the list because PICU is latex free (thanks Viv!) So they have changed her feeds. Poor girl is still itchy and rashy but in general ok. The plan is to have her home Thursday morning. Tomorrow is going to be flat out with training with the home health service who do everything o2, feeds, dressings, pumps, the works. We need to be trained on the o2 machine, suction, pulse ox etc etc Although to be honest all the organising has been done for us, I haven’t written a list or done a single thing. I have been told it is all sorted and I don’t need to worry. I hope they are right! Thank you to Nana and Poppa, Carol and Cordell whose time and effort made it possible and E&J whose generous gift made it possible. Thank you- it takes a village to raise a child and enrich a family. Aria hit an Omaha pothole last night. Actually at the time we thought it was a pothole, turns out it may be more like a filled in pothole. Got a call from PICU at 2am saying that she had had an episode of gasping for breath, turning blue and her stats down to 47%- EEK! What!? Was our groggy response. She had been doing so well and we were so surprised. I couldn’t sleep and needed to see her so went in to talk to the staff and understand what happened. 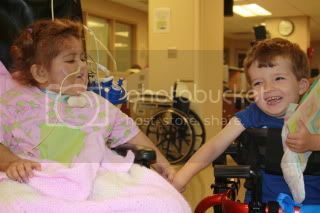 Her trach wasn’t blocked or anything. The o2 had come off (most likely she pulled it off) and for whatever reason she did not hold her own on room air. Strange given she was doing great on room air the pass couple of days. Chest xray was done stat and it looked exactly the same as normal. The team just thinks she is tired and we need to expand her lungs more. The speaking valve will help a lot with that but she hates it. It redirects the air flow within her lungs and while you and I do that all the time when we talk Aria hasn’t experienced that for months. So our home plans have been pushed out a couple of days. New surgeon on this week and she is fine with Aria going home but said more like Wed or Thurs. That’s ok. We want to be comfortable Aria is doing pretty well because we don’t want episodes like that at home. The breathing is the only thing keeping Aria in hospital. Her labs/bloods look great and today they changed blood draws to Mon, Wed, Friday instead of every day! Also important for going home. AND Aria doesn’t have to get sticked everyday too poor kid. Hamish and I are going away for the night tomorrow. The surgeon suggested we go two days but not sure if we can manage that. The team promised to call if there was any reason to come back but I think we couldn’t stay away that long. Nice of them to care though. Isn’t that amazing- after also 8 months living separately they still love each other. Mind you, they only spend a few hours together but some competition and sharing will do them both good. Bob and Christine arrived safe and sound after long travels and a bit of a delay due to bad weather. Both kids were pretty shy but warmed up quickly. The big news of the day is that the medical team have tentatively labelled Tuesday as the day Aria can be discharged home. Yes, you did read that right, home, H-O-M-E.
Of course there is always the potential for the unexpected with Aria, but we are praying very hard (and would like you to as well) that things would continue to improve and go smoothly so that can be a reality. Aria seemed to be more comfortable today now they stopped the medication they think she has developed an allergy to, hopefully that continues and she will be a happy little camper till Tuesday. Our mood could be described as cautiously jubilant. Tomorrow Aria has a procedure (scope of her her upper airway) that requires a leur to be put in for IV sedation. Hamish and I are really hoping to go away Sunday night for 24 hours before Aria is discharged. We are really hoping they are able to get a line in without drama or else it will have to wait until Monday and the ‘holiday’ will be off. Oh and Aria’s Nana and Poppa arrive here tonight, should be a great couple of weeks. Aria did her first night off the vent That’s great but how to interpret that? Did she do super awesome or did she just make it thru. Aria has had a nasty rash for almost a week now. First we thought it was a reaction to the ABX she was on so they stopped it. But it hasn’t improved infact today it is worse. Poor Sweeties is itchy and grumpy. Her skin is dry and red and sore looking. Her WBC is climbing each day. Her HR is high too. She has been having low grade fever 38.3 max. Current theory is that she is allergic to lasix/furosemide, it is a drug that helps her pee. They switched from an IV dose to oral twice a day. SO that would explain the rash, temp, HR and WBC. Add that to the fact we are weening her on her sedation drugs still meaning she might be having drug withdrawal too which would explain some things like the grumpiness and high HR. So back to the original question of how did she do off the vent. It is hard to tell what is tiredness and what is related the other stuff she has going on. Time will tell!